Two gaming veterans who helped create iconic title Doom are seeking cash to make a “classic” first-person shooter. John Romero and Adrian Carmack are seeking $700,000 (£480,000) on Kickstarter to make a game called Blackroom. The futuristic game will be set in a “holographic simulation gone rogue”. In a video, Mr Romero said the game would hark back to the original Doom, being “visceral, varied and violent” . Mr Romero and Mr Carmack are two of the four people that founded games company iD, which created Wolfenstein, Doom, Quake and many others. John Carmack (unrelated to Adrian) who was iD’s lead programmer, currently works for Facebook on its Oculus virtual reality headset. 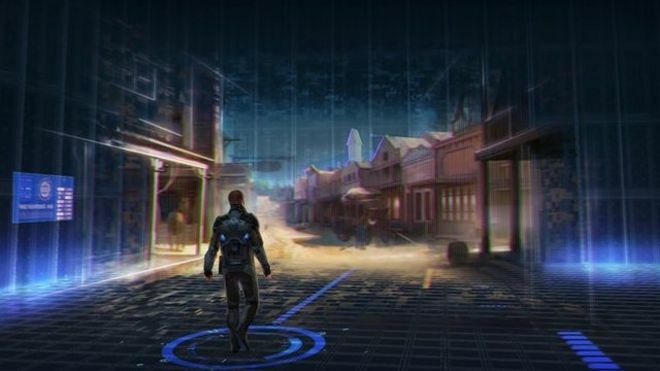 The summary on Kickstarter explained that Blackroom would use its holographic setting to let players fight in many different environments including ruined Victorian mansions, Wild West ghost towns and pirate galleons. In-game tools would let players “hack” the environment in line with its holographic theme. It would also feature the extensive gunplay seen in older titles and let players use circle-strafing and rocket jumping to take down opponents in single and multi-player maps. Software tools that let players create their own maps and modifications for the game would also be available at launch. Mr Romero said the project had been in the planning stages for some time and he had set up a company, Night Work Games, in Galway, Ireland to handle its development. The game will be released in late 2018 for both Windows and Mac computers.